[Hiking up Mount Elbert, Colorado’s highest! 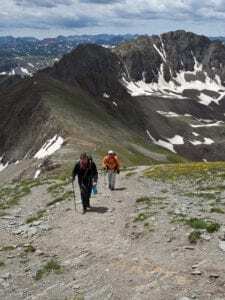 Photo: Greg Wilis] Climbing your first fourteener is on many people’s bucket list, and an essential “must do” item in Colorado. And if you don’t know, they are our state’s highest mountains, bucket-list hiking trails. 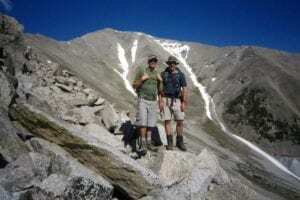 Over the last 10 years, I have climbed several of the fourteeners in Colorado and in other states, and have hauled my share of newbies up the mountain with me. After a decade of climbing the questions from newcomers have not changed much; what should I anticipate, how do I prepare, what should I wear, what should I bring? 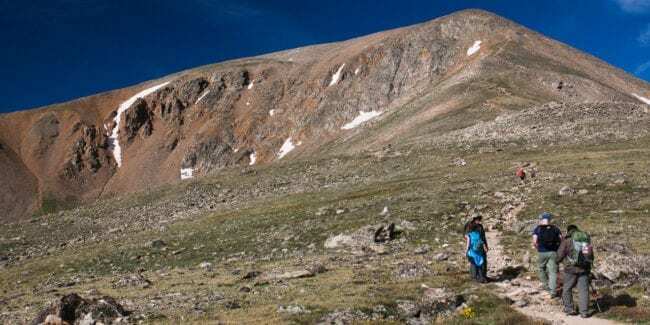 To assist those who are hoping to tackle their first fourteener and help people new to hiking in Colorado I will answer all the questions above and a few more in hopes of making your first journey up a fourteener a successful one. Climbing a fourteener is not easy but with proper preparation it can be a whole lot more enjoyable. Getting physically fit, being mentally prepared, wearing the appropriate clothing and carrying the proper gear will all make your first adventure to the mountains a safe and gratifying experience. 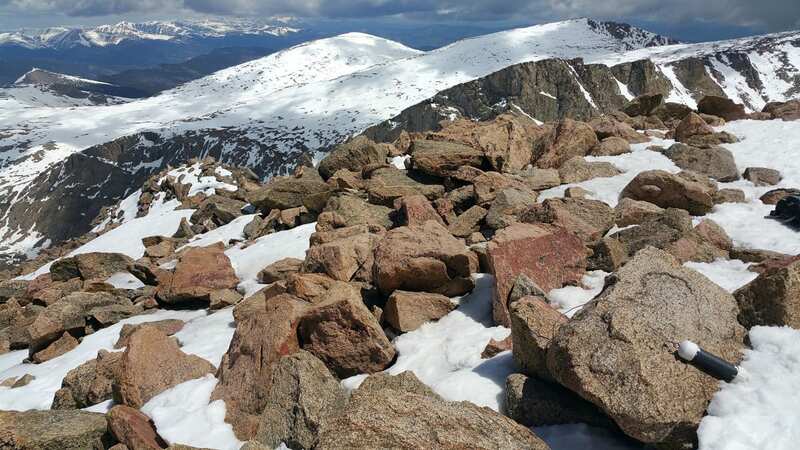 So, where should you begin on the path to summiting your first fourteener? Let’s get started. 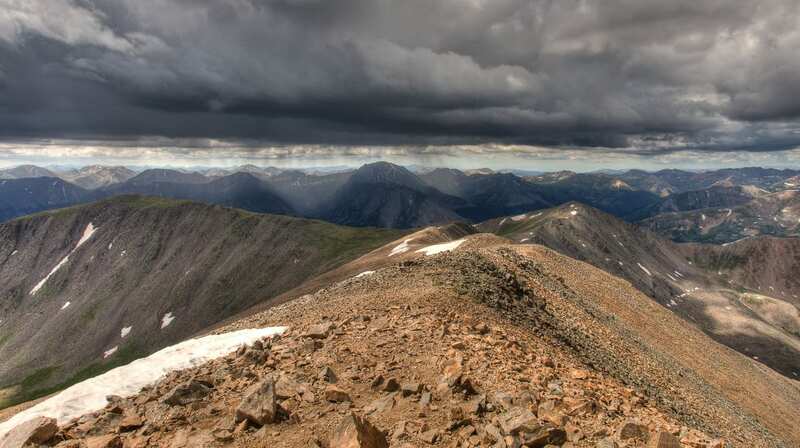 Fourteeners, sometimes abbreviated as 14er, are mountains that rise over 14,000 feet above sea level. Here in Colorado, we have 54 fourteeners spread throughout the state, ranging from challenging hikes to advanced technical climbs. Fourteeners are classified by difficulty but since we are talking about your first one I will only cover two classes. No route-finding necessary and has a well-marked and worn trail. 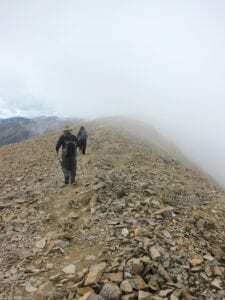 This can vary from mountain to mountain but typically it means a semi-worn trail to no trail at all and the trail surface might be steep and have loose dirt/scree. Finding the route may be challenging in sections and scrambling (using your hands) might be necessary. 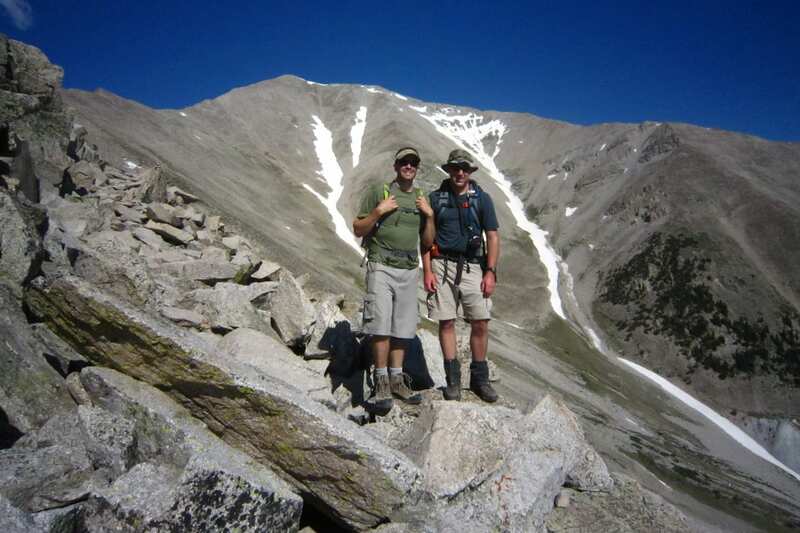 The beginner friendly fourteeners in these classes in Colorado are: Grays Peak, Torreys Peak, Handies Peak, Mount Sherman, Mount Democrat, Mount Bross, Mount Lincoln, Quandary Peak, Mount Evans, Mount Bierstadt, Mount Elbert, Mount Massive, Mount Antero, Pikes Peak, Mount Princeton, Culebra Peak, San Luis Peak, Huron Peak and La Plata Peak. Summit canister on Mount Bierstadt. Photo: James Tiffin Jr. Which peak is the best peak for your first time? 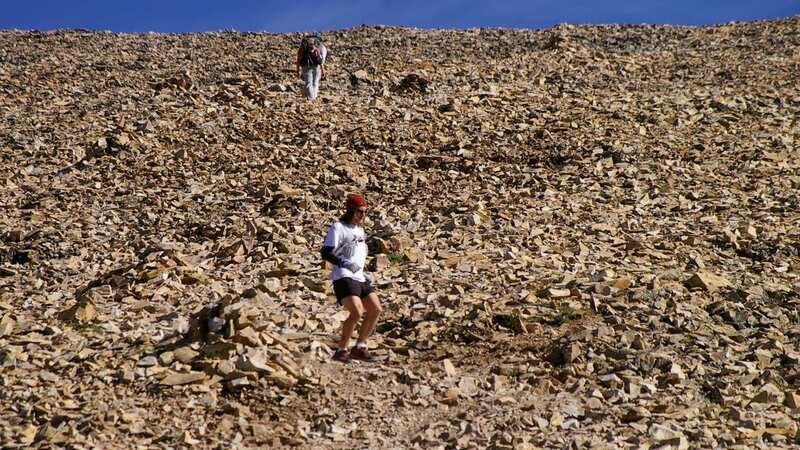 Now that you have decided to climb a fourteener, the next big obstacle is choosing which of the easier peaks to attempt. Three things to consider when choosing which peak to tackle for your first are: elevation gain and loss, route difficulty and total distance. A common rule of thumb would be a hike with about 3,000 feet of elevation gain on a well-marked trail and a distance of no more than 8 miles. Remember though, there’s no such thing as an easy fourteener, so be prepared for a tough hike no matter which peak you choose. Grays Peak or Torreys Peak or both! Mount Democrat – add Mount Bross & Mount Lincoln for a threefer. Personally I encourage new climbers to start with Grays Peak or Mount Elbert, both of which I have taken friends to the summit regularly. 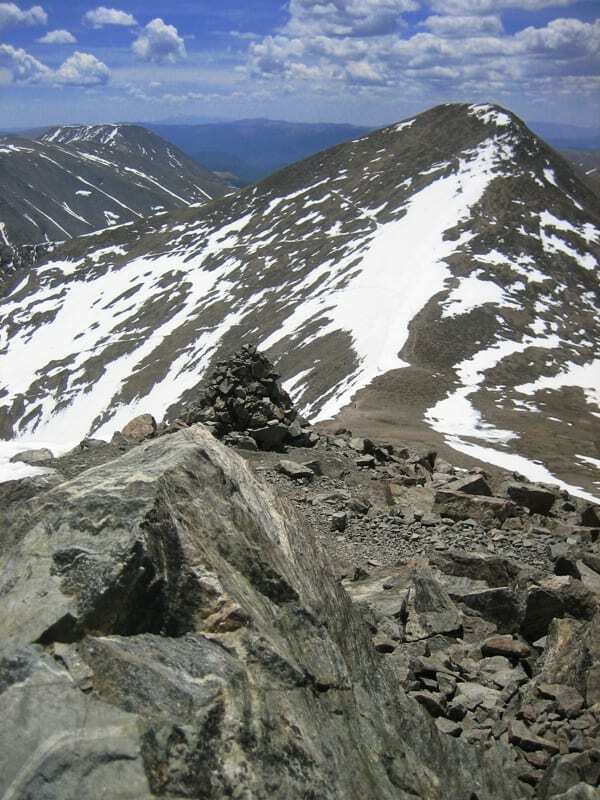 After you have chosen your fourteener you need to plan and study the route to the summit. 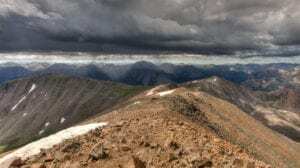 There is a wealth of information online that covers all of the Colorado fourteener statistics from route length, elevation gain and trail conditions, even some printable maps. Many websites and social media also post comments from people that have recently climbed the peaks so you can get up to date information. Be sure to check the access to the trailhead itself. Some trailheads are accessible only with a 4WD vehicle. This mistake is made by a lot of new climbers and it can add 2-6 miles of hiking they did not account for. Know where you can park before you go. If you’re coming from a lower elevation state, you’ll want to spend a few days letting your body acclimate to the higher altitude before your hike. This will give you time to acclimate, hydrate, and revise any plans. Altitude sickness is the most common setback when climbing at higher elevation. You need to be aware of the symptoms, watch for warning signs and remember altitude sickness can strike anyone! Be alert and aware and always pay attention to any of these signs: dizziness, nausea, vomiting, and headaches. If any of these occur to you or anyone in your group, stop, take a rest, drink some water, and evaluate the situation. If you believe you’re suffering from altitude sickness, try descending down a few hundred feet. Reevaluate if you are feeling better, if you do resume your climb, if not keep going down and call it a day. 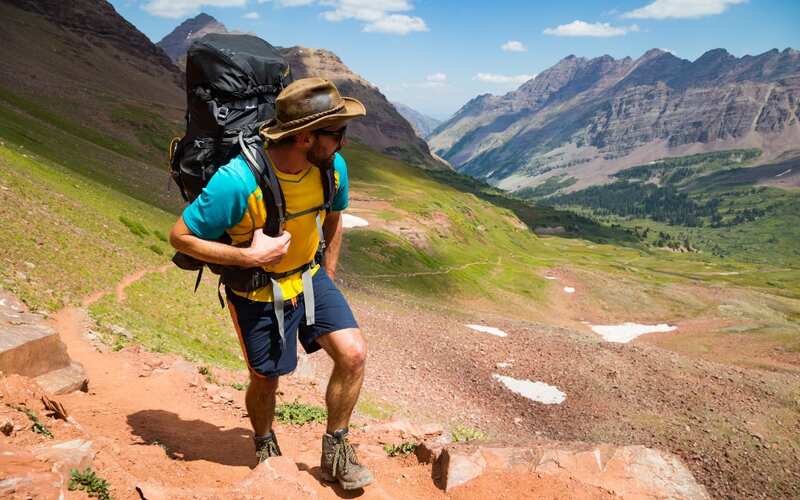 Most of the beginner friendly fourteeners can be completed in half a day; others take much longer, either way you need to pack some basic gear. Depending on which peak you choose, your skill level and the season the gear you carry may vary. DO NOT over pack with a ton of gear you don’t even know how to use! I see this all the time and it will wear you out and for goodness sake, take the tags off your equipment. The weather changes rapidly, so layering is vital to ensure you can shed clothing or add additional protection. You want to be able to do this quickly to pack properly. It’s ok to add any extra layers for warmth if you know you get especially cold. 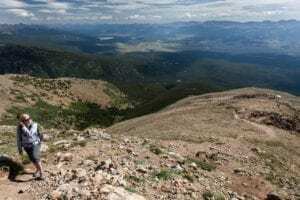 It is never recommended going solo for your first time up a fourteener. It is best to have at least one other person, preferably someone who is experienced with climbing to hike with you. Having that added support with you is especially helpful in the case anything goes wrong. Start Early -Start Early- Start Early. I cannot stress this enough. Most of the time I start my accent well before sun up so I can be on the trail at daybreak. This is when weather is the best and catching the sunrise is always remarkable. Weather in the mountains changes quickly and can be very dangerous that is why it is the most important factor to consider during the entire climb. Summiting a mountain is slow and steady. Find a pace that you can sustain for the expected 8 to 12 hours of hiking. You’ll achieve your goal if you pace yourself, take slow steady steps, and break for food and water often. Stay hydrated! Drink early and often is the rule. Be sure to bring plenty of water, I recommend a water bladder with 100 ounces in it plus I tend to carry a 2-liter Nalgene bottle with some sports drink in it also. Make sure you are consuming small portions during the climb and on your breaks; this will sustain energy and prevent fatigue. Pringles, salami and plain M&Ms are my favorites. Do not push yourself too hard – climbing at altitude is demanding. You’ll fatigue faster, breathing will be challenging, and your heart rate will be elevated. Storms roll in like clockwork after 12pm so be sure to always keep watch on the sky. Never hesitate to head down if it looks like a storm might be rolling in. You do not want to get caught in a rain or lightning storm. You don’t have to reach the top in order to experience a fourteener. Yes, the summit is the objective, but not at the cost of injury or dangerous weather. Aim to be off the summit by noon, earlier is better. You have to respect the mountain and not take it for granted. Don’t be scared to turn back, even if you’re near the top. You want to be back at the car well before dusk. Finally, when you make the summit, relish the moment! Soak in the views. This is a big accomplishment, take time to enjoy it and reflect on your success. It may have been harder than you expected, but the feeling of standing on the top will be well worth it. Insiders tip: sign the registry on the summit! Time to descend, take your time and take it easy on the way down. Your legs will be worn-out and it’s easier to twist an ankle or loose your footing going downhill. Most accidents happen on the descent so be sure to have fuel left in your tank and stay mentally sharp so you can reach your vehicle and go enjoy some fabulous Colorado food and beverages to celebrate your accomplishment. June 19, 2013 – Hiking at over 14,000 feet is unique to only four U.S. states. Colorado, California, Washington and Alaska all have mountains over 14,000 feet. Colorado has the most 14’ers with 54. Mt. 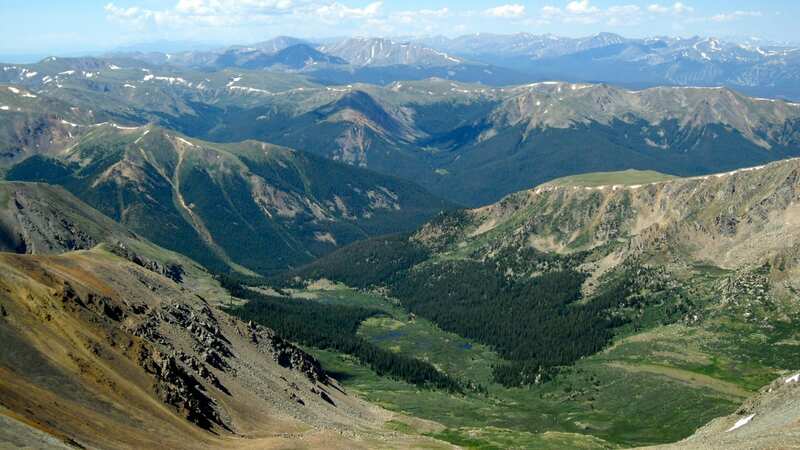 Elbert is the highest at 14,440′. Mt. Bierstadt – Guanella Pass near Georgetown, 1.5 hours from Denver. Hike is 7 miles, 4.5 – 5 hours round trip. Grays and Torreys Peaks – West of Georgetown on I-70, just over an hour form Denver. Hike is 8.25 miles, 6 hours roundtrip. Mt. Democrat, Mt. Cameron, Mt. Lincoln, Mt. Bross – Known as the Decalibron Loop near Fairplay, 2 hours from Denver, 7.25 miles, 6 hours roundtrip. 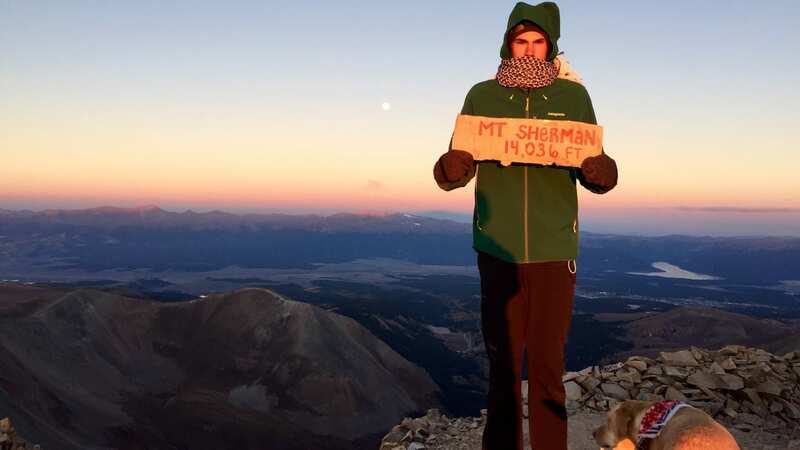 Mt Sherman – Near Fairplay 2 hours from Denver. Hike is 5.25 miles, 3.5 hours roundtrip. Huron Peak – North of Buena Vista, 3.5 hours from Denver. Hike is 6.75 miles, 5.5 hours roundtrip. UCO: What was your favorite 14’er to hike? LK: Of the nine 14ers that we tackled as a staff, I think we would agree the Decalibron Loop was the most rewarding for a feeling of accomplishment, for the elevation of Mt. Lincoln, and the views from four different peaks. UCO: Which one is supposed to be the easiest? 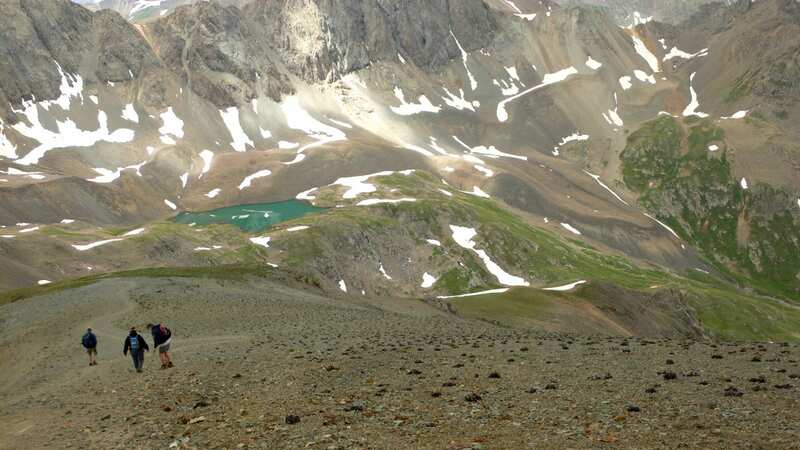 LK: There are nine fourteeners generally considered to be the easiest of the 17 “easy” ones. Of those, Grays, Torreys, and Bierstadt are very do-able and they’re close to Denver, which makes the trip that much simpler. UCO: Which ones are best for dogs? LK: This is a difficult question because whether you should take your dog on a fourteener depends on the health and fitness level of your dog. It also depends on how comfortable you are keeping your dog on a leash for the entire hike. If you do take your dog on a fourteener, I’d definitely recommend going on a Class 1 route first and frequently checking your dog’s paws for cuts and blisters. If you see damage, turn around. If your dog seems fine and is handling the hike well, keep on going. Just remember that you are responsible for your dog; treat him or her like any other climbing partner. UCO: Do you have any advice for a first timer? LK: Start your hike as early in the day as you can—6 a.m. is not an unusual start time. You’ll want to do this so that you can go at your own pace, summit, and finish your hike before afternoon thunderstorms roll in. Read 5280’s Higher Ground for the full beginner’s guide to 14’ers. A few places to drive up over 14,000 feet include Mt. Evans, which is the easiest hike of all if you drive up to 14,130′. The summit is at 14,264′. Pikes Peak Highway takes you to the top at 14,115′, so there’s no hike, but it’s 14k! For a complete list of 14K peaks, check out 14ers.com. 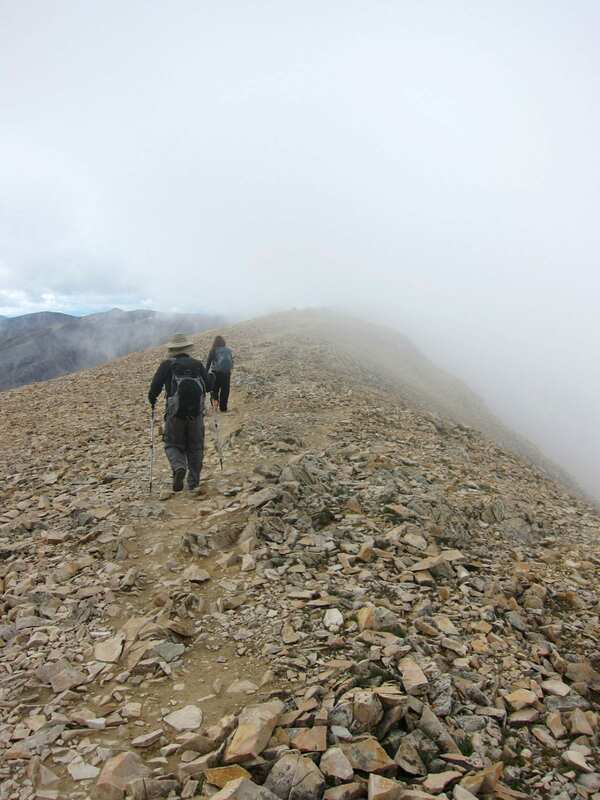 Hiking up a fourteener is an exhilarating experience. While hauling yourself to the top may seem like an intimidating task, if you plan it out and know how to prepare and follow the advice of experienced climbers, you’ll be on summit in no time. Fair warning though, once you experience the exhilaration of reaching the apex, you might develop summit fever! Jason C. Gass is a freelance writer who spends his days exploring Colorado's backcountry and writing about it. He's an outdoor enthusiast with a passion for his family, craft beer, travel and writing for his website Brews Food Travel.